I don’t normally advocate sitting in front of a vat of cheese and calling it dinner. 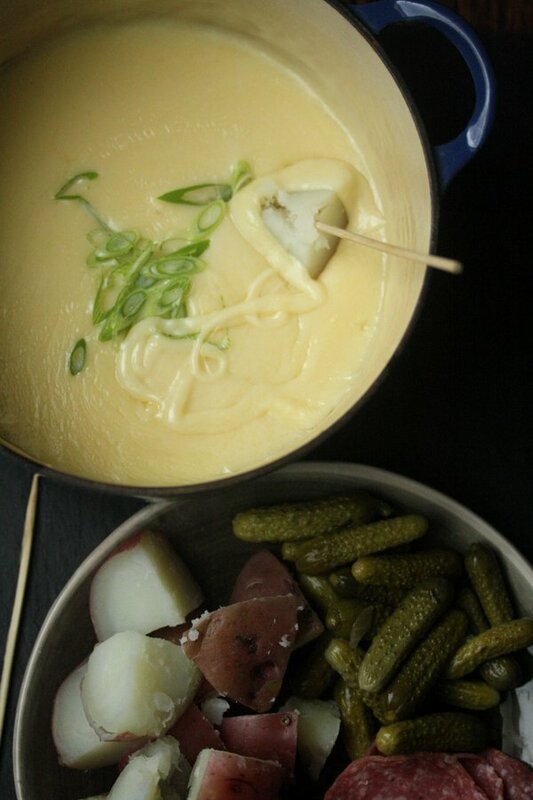 But at certain times and for special occasions, cheese fondue might just be one of the more intimate and fun ways to spend time with friends. If you’re a little bit better than I am at not getting melted cheese all over your face and garments, it can also be rather romantic. I’ve been a longtime fan of the secret back area of Café Select. It used to be a mythical place that you’d find your way to (through the kitchen) at 1 in the morning, and then wake up the next day unsure whether or not the whiskey cider and house music was all a dream. Since the hay days of 2007, probably because one too many people accidentally fell off the ladder en route to the lofted seating area, the restaurant now uses the back room just for dinner. And it’s known informally to us insiders as the Fondue Room. I’m so obsessed with the Fondue Room that last spring when Barefoot Contessa was doing a New York insiders series, I insisted to Ina that she come check it out as part of one episode. It wasn’t until I got to break bread with her, and then dunk it in cheese, that I found out the chef at Café Select actually has a Michelin star from her pre-fondue days. It also means that I now have access to her recipe. Charlie never met a cheese he didn’t like. 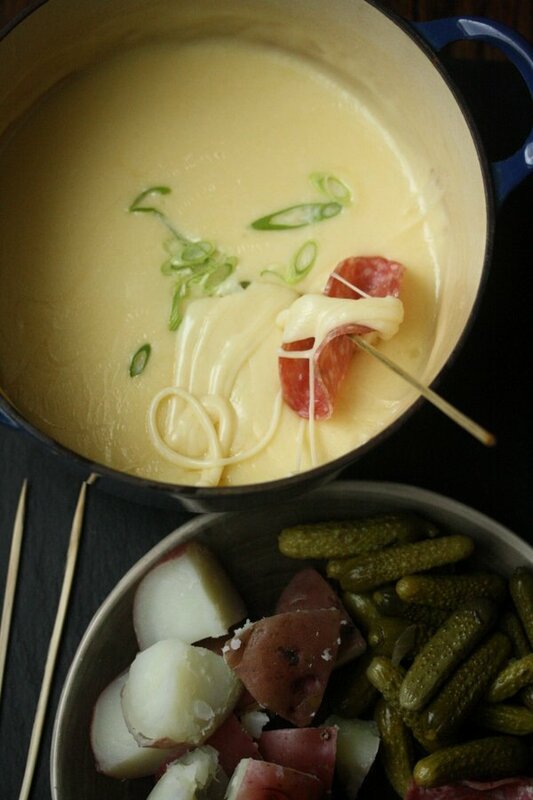 So if I were hypothetically designing an ideal romantic meal for us, instead of eating Thai takeout on the couch while watching Som, which is the plan, a big pot of melted cheese with carbs and sliced meat for dipping would probably be pretty close to perfect. 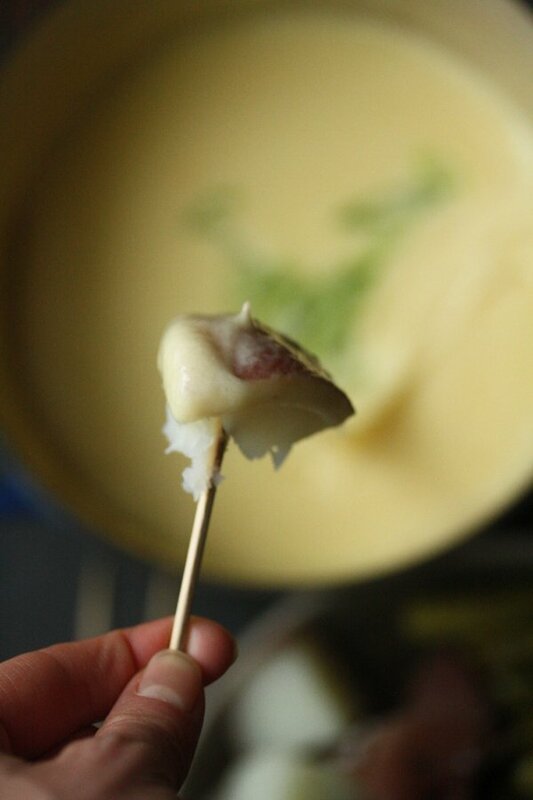 If you’re looking for something quick, easy and interactive to share on Valentine’s Day, I highly recommend getting intimate with this cheese fondue recipe for two. Just try to avoid getting it in your hair and all over your clothes, unless you’re into that sort of thing. Whip cream bikinis are so 1999. 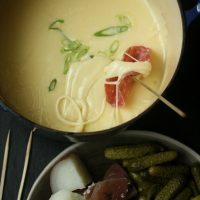 You don't need a fancy fondue pot and skewers for this recipe - though of course it makes life easier. 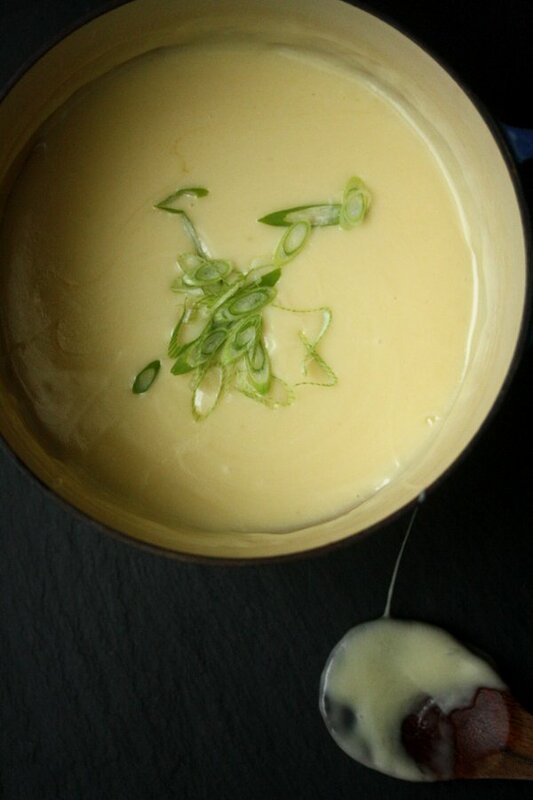 Just use a heavy-bottomed pot (which will maintain some heat) and some bamboo skewers for dipping. 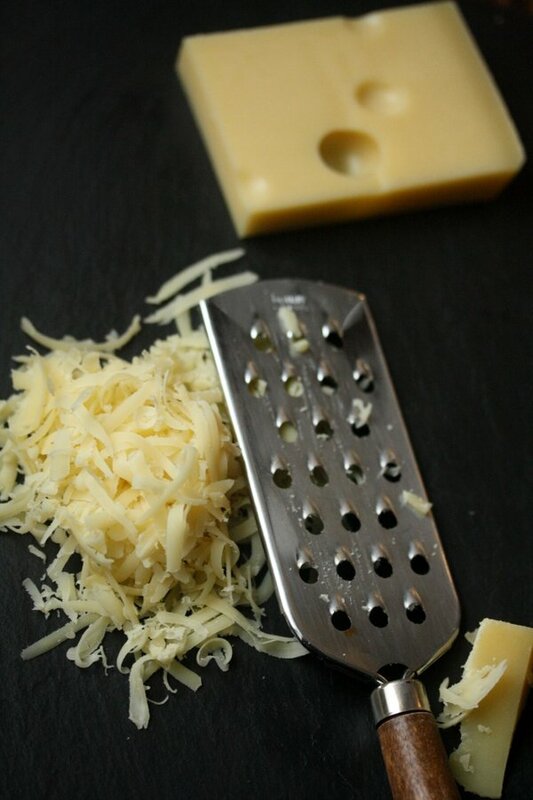 You make need to stick it back on the stove once or twice to reheat if the cheese starts to get too stringy. Another alternative is a microwave safe bowl. 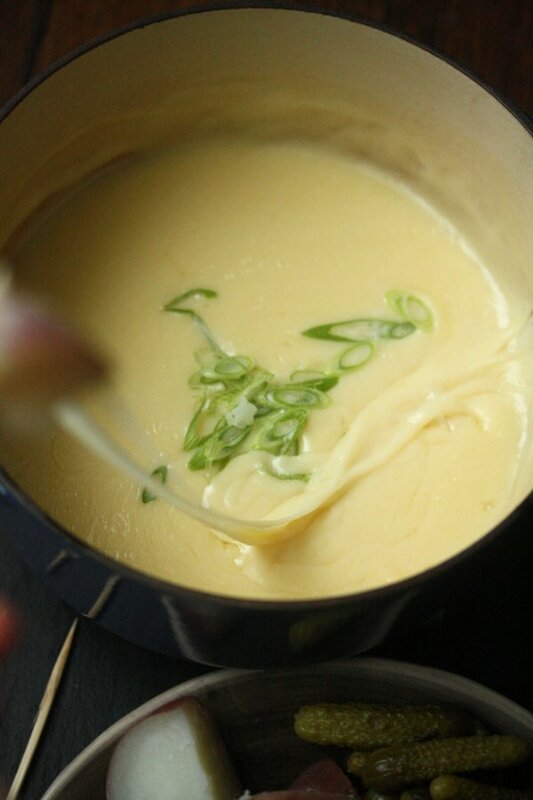 Place the wine and garlic in a small saucepan and bring to a simmer over medium heat. 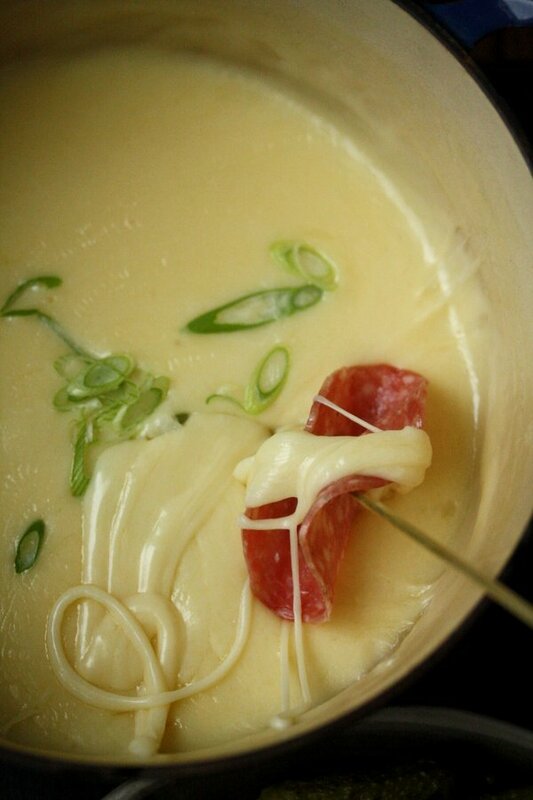 Add the Gruyere and Emmanthaler cheeses. 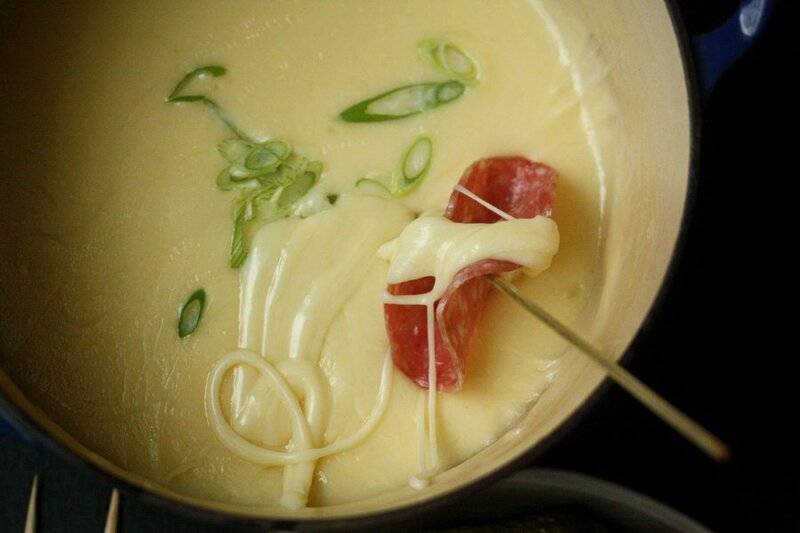 Cook over medium heat, stirring occasionally, until the cheeses begin to melt, about 4 minutes. In a small bowl, whisk together the cornstarch, kirsch or brandy and 1 tablespoon water until the cornstarch is dissolved. 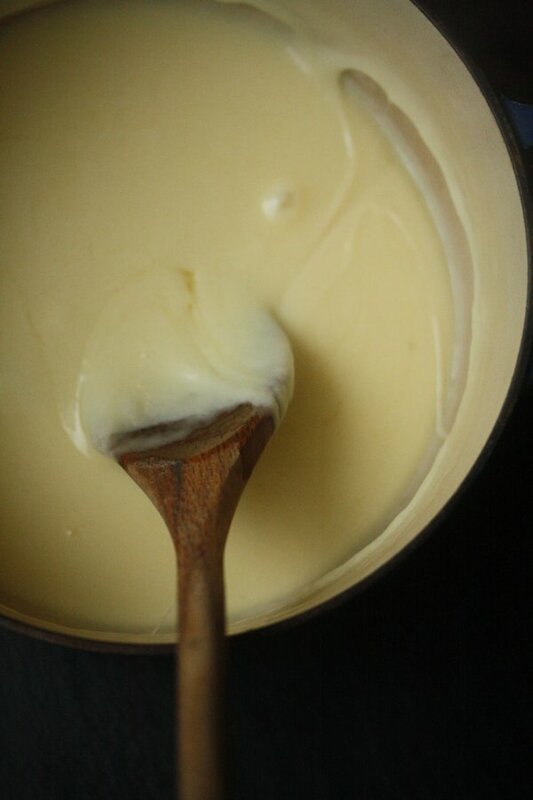 Add to the cheese mixture and continue to cook, stirring occasionally, until silky smooth, 5 minutes more. 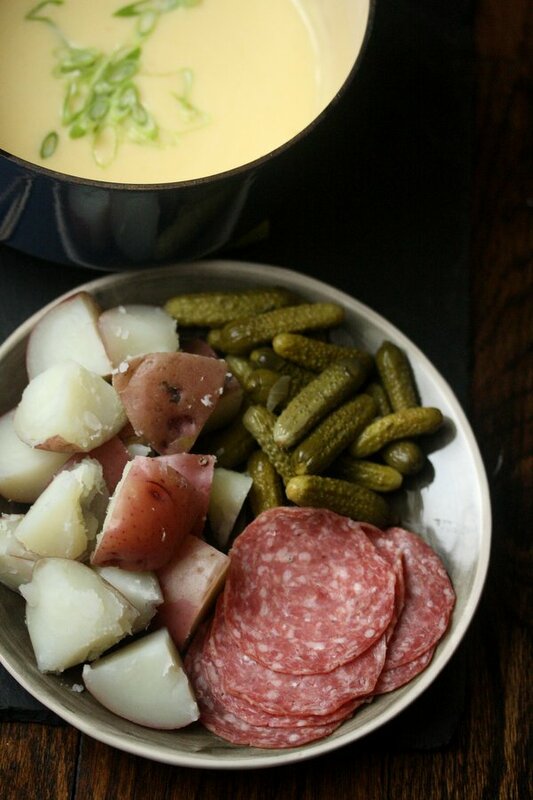 Season with salt and pepper and serve immediately alongside cubed bread, boiled potatoes, sliced meats, and pickles. I never heard of dipping potatoes! Or cornichons or salami. My boyfriend will go wild for this.